Rotation of the eyes in their sockets is brought about by the action of the extrinsic ocular muscles. The muscles enable the eyes to scan the field of vision and in the case of the spectacle wearer, to view through extra-axial points of the spectacle lenses. This statement sums up, in a nutshell, the problem facing the designer of spectacle lenses; how to produce a lens which has the same effects when viewing off-axis, as it does when the subject views through the optical centre? When the eyes rotate behind a spectacle lens to view off-axis objects, it is assumed that they rotate about a fixed point near the middle of the eyeball. To the lens designer tracing meridional rays into the eye, the fact that the real pupil of the eye, which of course, rotates with the eyeball, can be totally ignored and an assumption made that there is a small fixed stop located at the eye’s centre of rotation through which the chief ray of the oblique pencil passes on its way to the fovea (Fig. 1). Even when real rays (skew rays) are traced through the actual pupil of the eye, it is the pupil size which becomes important, rather than its position, and the chief ray of the oblique pencil is still assumed to pass through the eye’s centre of rotation. Fig. 1: The significance of the eye’s centre of rotation. Note the imaginary stop placed at the position of the eye’s centre of rotation. The dashed line which passes through the back vertex of the lens is the vertex sphere from which the oblique vertex sphere powers are computed in oblique gaze. It will be realised that when designing a spectacle lens to have a particular off-axis effect, for example, to be free from aberrational astigmatism (point focal lens), it is the position of the eye’s centre of rotation with respect to the lens which must be known, rather than the vertex distance, which is simply the distance from the back vertex of the lens to the cornea. Of course, the vertex distance determines the correct back vertex power of the lens but, otherwise, is of no real interest to the lens designer. It can also be seen in Figure 1 that when the eye rotates behind the lens, away from the optical axis, the distance from the apex of the cornea to the back surface of the lens increases. Thus, in order to be able to compare the off-axis effects of different forms of lenses it is necessary to set up a reference surface at which the off-axis powers can be measured. This reference surface, which is concentric with the eye’s centre of rotation, is called the vertex sphere and is shown by the dashed circular trace in figure 1 which just touches the back vertex of the lens. The vertex sphere is an imaginary spherical surface centred at the eye’s centre of rotation, the radius of which is called the centre of rotation distance, CRD, and the off-axis powers of the lens are measured at the vertex sphere. These powers are known as the oblique vertex sphere powers since they are measured along the oblique ray path from the vertex sphere. 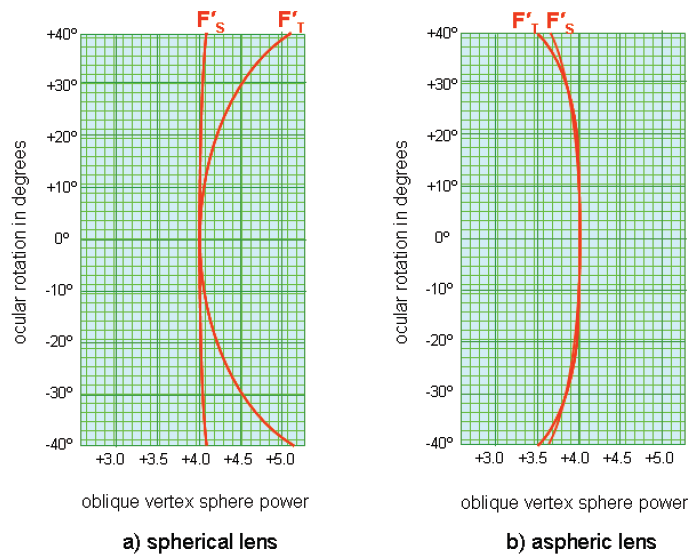 Figure 2 illustrates how the lens designer might show the variation in the oblique vertex sphere powers for a +4.00 D spectacle lens made first with a +5.50 D front spherical curve (Fig. 2a) and secondly with a +5.50 D convex hyperboloidal front curve (Fig. 2b) whose asphericity has been chosen to eliminate the difference between the tangential and sagittal oblique vertex sphere powers to produce a point focal lens. It is seen from these field diagrams that in the case of the lens with spherical surfaces, as the eye rotates away from the optical axis, the tangential oblique vertex sphere power, F'T , increases at a faster rate than the sagittal oblique vertex sphere power, F'S. When the eye has rotated through 35º from the optical axis, the sagittal power, F'S, whose value is +4.06 D, has hardly changed from the back vertex power of +4.00 D, but the tangential power, F'T has become +4.92 D. The difference between these two values, given by F'T - F'S is the oblique astigmatic error, OAE, which amounts to +0.86 D. This degree of aberrational astigmatism would, of course, cause a significant amount of blur when the subject viewed through this zone of the lens. In order to eliminate this astigmatism for the 35º zone of the lens, when just spherical surfaces are employed, the lens must be bent into a more steeply curved form with a +9.50 D front curve. Naturally this more steeply curved form will be thicker and heavier and more bulbous in appearance, not to mention that, from an observer’s point of view, the subjects eyes appear larger when viewed through the lenses. Figure 2b illustrates the improvement in the optical performance when an aspheric design is used for this lens. The front surface is a convex hyperboloid with an asphericity, p = -1.75, whose inherent surface astigmatism neutralizes the aberrational astigmatism of oblique pencils. For the 35º zone of the lens, the tangential and sagittal oblique vertex sphere powers are each +3.73 D and the OAE for this zone has been completely eliminated. Note, however that the off-axis performance is not perfect, there is a power error of -0.27 D for the 35º zone. The lens designer refers to this error as mean oblique error, MOE. Fig. 2: Field diagrams comparing the off-axis performance of spectacle lenses of power +4.00 D.
a) +4.00 D lens (CR 39) of poor form, made with spherical surfaces. Front curve, +5.50, axial thickness 4.0mm, CRD 27 mm. b) +4.00 D lens made with convex hyperboloidal surface, p = -1.75, Front curve +5.50, axial thickness 4.0mm, CRD 27 mm. When the eye is looking along the axis, through the optical centre of the lens (0º) the effect of the lens is +4.00 D. When the eye rotates upwards (+ sign on the rotation angle) or downwards (- sign on the rotation angle) the tangential and sagittal oblique vertex sphere powers differ from the axial value.The variation in power is plotted horizontally. One of the major advantages of digital surfacing is that the software enables individual fitting characteristics to be entered upon receipt of the order by the laboratory to ensure that the original design criteria is still fulfilled by the lens. A typical situation is demonstrated by the field diagrams shown in figure 3. In figure 3a, the point focal aspheric +4.00 D design whose off-axis performance is illustrated in figure 2b has now been mounted 4mm closer to the eye than the designer intended, the CRD being only 23 mm. The field diagram shows quite clearly that the lens is now afflicted with aberrational astigmatism amounting to some 0.25 D for the 35º zone of the lens. Although this is only a small amount of astigmatism, it will be appreciated that we can no longer honestly describe the lens as being point focal! However, if the input software is told that the CRD which is required for this wearer is 23 mm, it can be incorporated into the design steps, with the result that the asphericity of the convex hyperboloidal surface will change to the necessary value (p = -3.02) in order to restore the point focal property of the lens for the prescribed fitting parameter (Fig. 3b). Fig. 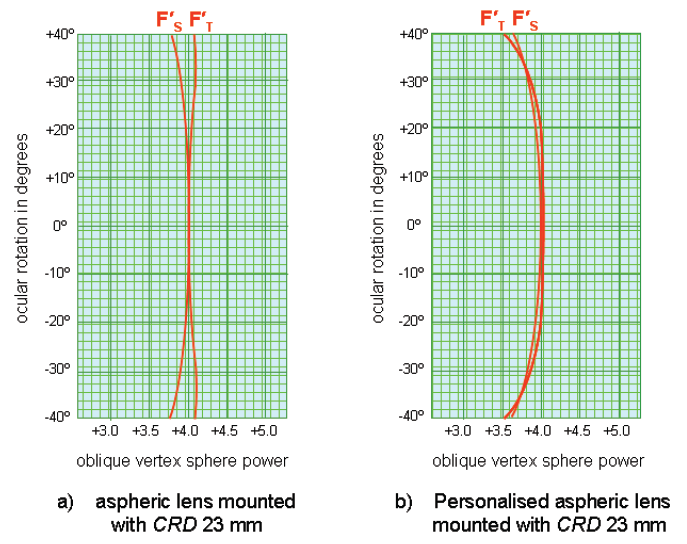 3: Field diagrams comparing the off-axis performance of an aspheric +4.00 D lens fitted at a shorter CRD (23 mm) than the designer intended. a) +4.00 D aspheric lens made with convex hyperboloidal surface, p = -1.75, Front curve +5.50, axial thickness 4.0 mm, CRD 23 mm. b) Free-form +4.00 D aspheric lens made with convex hyperboloidal surface, p = -3.02, Front curve +5.50, axial thickness 4.0 mm, CRD 23 mm. It is important for comfortable binocular vision that any differential prismatic effect which is encountered when the eyes rotate to view extra-axial objects in the field is not excessive. This is particularly so when considering vertical differential prism because the eyes should not be called upon to exert supravergence movements. When single vision lenses are worn, it is usually only in cases of anisometropia that differential prism might present a problem. However in the case of progressive power lenses, it is important when the eyes execute version movements to ensure that both Minkwitz astigmatism and the mean power in different zones are similar to ensure that vertical differential prism is kept to a minimum. Needless to say, since the eyes rotate about their centres of rotation, accurate knowledge of its position is necessary to ensure comfortable vision. This requirement of ensuring that the vertical differential prismatic effect remains within tolerable limits is but one of the important features of the new Varilux® 4D S-series progressive lenses (“Synchroneyes”). It is obvious from this discussion that when the position of the lens in front of the eye is incorporated into the design, the essential piece of information which is required is not the vertex distance but the centre of rotation distance. How can we measure the CRD in practice? The difficulties are not just practicaI ones, in that we do not have access to the eye’s centre of rotation! It is now understood that there is not a single point about which the eye rotates but that the position varies not only from eye to eye but also with the direction of gaze. In the past, it was usual for the designer to choose an arbitrary value based upon the best measurements available. where F'V is the back vertex power of the lens. This rule recognised the increasing backward shift of the centre of rotation in axially myopic eyes. For example, in the design of a -6.00 D lens, the CRD would have been taken to be 26mm, which was probably a reasonable value for the small lens diameters which were in use at the time. Fry and Hill (1962)  found that in a group of 28 of their subjects, the mean position of the eye’s centre of rotation was 0.79 mm nasalwards from the visual axis and 14.8 mm behind the corneal pole. A typical mean value today which is frequently used in English speaking countries for the CRD is 27 mm (made up from a vertex distance of 12 mm, with the centre of rotation assumed to lie 15 mm behind the corneal pole). base point of the perpendicular drawn from the mechanical ocular centre of rotation onto the line of sight. The first of these new definitions recognises that the visual axis (line of sight) may not pass through the point about which the eyeball rotates, which must lie close to the centre of curvature of the sclera, whilst the second describes a method by which the position of the centre of rotation that is of concern to the lens designer may be located. Today, it is no longer necessary to estimate the position of the eye’s centre of rotation. Its position can be measured precisely with the sophisticated fitting instrument, VisiOffice®+ illustrated in figure 4. Visioffice®+ is designed to provide not just the CRD but all the necessary fitting data required for the accurate positioning of spectacle lenses and also to determine the dominant eye for the new Varilux® 4D S-series progressive lenses. Fig. 4: Visioffice®+ (Essilor). For precise measurement of the position of the eye’s centre of rotation and other fitting parameters for personalized lenses. 01. Donders F C 1864 Accommodation and Refraction of the eye. The New Sydenham Society, London.